Another 217 wins & 295 nominations. Linda (Linda Bove) was the first deaf regular character on American television. Announcer: And now, It's time for the newest, hippest, best dressed detective show on television: "Miami Mice!" Kermit the Frog: Yeah, There are pal trees out there. What? What's on the palm tree? What's on? Oh, I am on. Oh, I am on. Oh, Cue the music! Earlier skits with the yip-yip martians have them consulting an "Earth book" to learn about different things they discover on Earth. Yet a later skit has them discovering a book for the first time and trying to figure out what you do with a book. The episodes that originally aired on a Friday somewhere between 1969 and 2000 had an additional message in the funding credits saying "Recorded at Reeves Teletape III" until 1987. 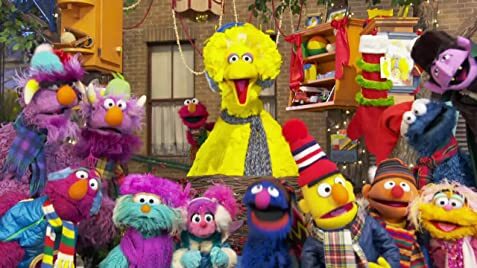 Starting around the 18th season of the show, the message then said, "Facilities by Unitel Video, Inc."
In 1970, an experimental edit of the show, entitled "This Way to Sesame Street", was briefly syndicated. It featured programs that were edited to include slightly different opening credits and paid commercials and was offered to commercial TV stations as a means of cashing in on the show's success. The project was scrapped after several weeks, and full effort was placed on the non-commercial version of the program.